Here at Umansky Motor Cars we have a sports activity vehicle that we know you're going to want to find out more about. The BMW X3 is simply packed with innovative and helpful features. Whether you want safety, performance or storage features, this vehicle has just what you're looking for. 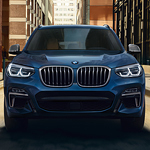 We're sure that safety is at the top of your necessary features list, and the BMW X3 doesn't disappoint. This BMW offers drivers the Active Guard System that constantly monitors accident risks and alerts the driver to take action. A Standard Park Distance Control gives you the confidence you need when parking in new or difficult parking spaces. Storage is never a problem with this car. Split fold-down rear seats give this SAV plenty of room for everything you need for your next road trip. Upgrade your vehicle further with an optional trailer hitch. There are many more features we'd like you to see. Give us a visit at Umansky Motor Cars and take one out for a test drive.